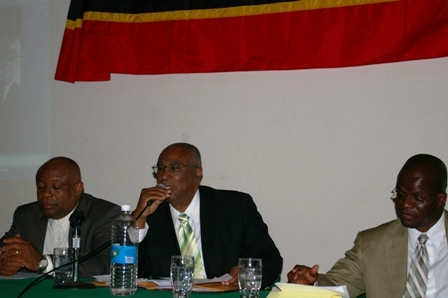 (CHARLESTOWN, NEVIS–MONDAY MARCH 21ST, 2011) Deputy Premier and Minister of Social Development, the Hon. Hensley Daniel described the many programs and policies put forth by his Nevis Reformation Party led Nevis Island Administration (NIA) for Senior Citizens and Youths on Nevis during a Town Hall meeting with Nevisians residing in Anguilla. 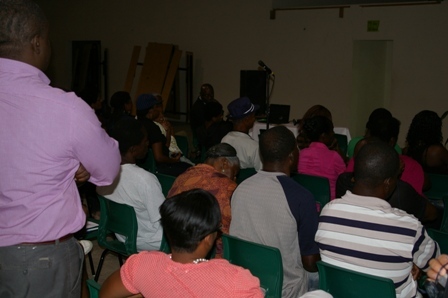 The meeting took place at the Rodney MacArthur Rey Auditorium on Saturday. Minister Daniel discussed the importance of seniors in the society and the need to encourage and support them to live constructive and meaningful lives. “We have organized a ‘steel pan orchestra for seniors’, which enables them to learn and play steel pan and gather with fellow seniors and perform. This is important to boost the morale of seniors in Nevis,” said Mr. Daniel. According to the Deputy Premier, the Nevis Reformation Party (NRP) led Administration has organized a number of programs for seniors including arts and crafts classes in Community Centers, day trips for seniors, hot meals and film days where seniors can watch movies together as a group. “We want the elderly to feel that they are not left out of the society as they have laid the foundation of nation building on Nevis,” said the Hon. Hensley Daniel. In relation to youth, Minister Daniel outlined the many programs for young people on Nevis including a program called HYPE (Helping Youth Prepare for Employment). The program is designed to help youth prepare for employment by sending young men and women to Trinidad and Tobago for three months to get certified in areas like auto mechanics, plumbing, electrical, carpentry, masonry and welding. Mr. Daniel also expounded on Nevisian Pearls, a program which is a course for the mentoring of young women and the Homework Assistance Program which has been very helpful for students in preparing for exams and completing homework assignments. Reading Starts with us is also another program geared towards young people in a concerted effort to promote reading between parents/guardians and their children.